This CUSTOM WATERFRONT POOL HOME in the serene GATED community of CORAL COVE is the one you have been waiting for! 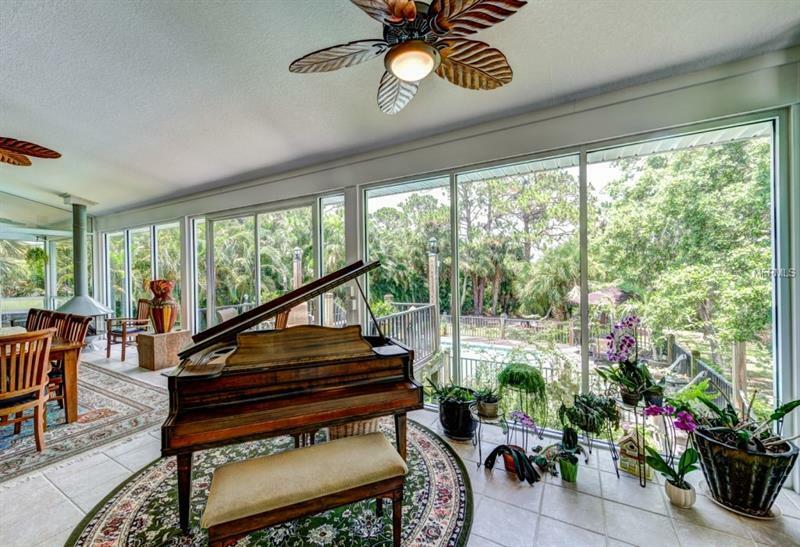 Feel the OLD FLORIDA CHARM as you ride up the pavered driveway nestled among tall pines and large heritage oak trees to your own private tropical oasis on almost 3/4 ACRE. Entering the home through the beautiful etched glass double doors a wide foyer entrance with a wooden staircase takes you up to the ONE LEVEL LIVING AREA where you will be overwhelmed with the breathtaking FLOOR-TO-CEILING GLASS ENCLOSED SANCTUARY/FLORIDA ROOM with gas fireplace overlooking the elevated CUSTOM DECKING and HEATED POOL and beautifully landscaped rear yard. The residence features 3 bedrooms each with their own private bath over $50000 of custom built-ins and an office with 2 separate work areas ~ kitchen includes a built in dual-zone wine refrigerator warming drawer & dumb waiter ~ Master Suite has private screened porch where you can relax in the hot tub overlooking the heated pool below. The lower lever features a 2+ car garage with over 2300 s.f. currently accommodating 6 bunk beds AIR-CONDITIONED WORKSHOP & STORAGE AREA and is accessible by an interior staircase ~ lower level paver deck currently utilized as an open greenhouse area ~ serene lushly landscaped backyard with a paver walkway extending down to your own PRIVATE DOCK with COVERED BOAT LIFT where the deep-water AMBERJACK CREEK canal leads you out to the magnificent Coral Creek Estuary to the ICW out to the GULF OF MEXICO! Why wait? Courtesy of Wendy Reinhardt Realty, Inc.